Finished in a stylish, waterproof housing, the OMNIKEY® 5321 CR represents the ideal reader for contactless technology applications in clean room environments such as manufacturing sites or hospitals with high demands for hygiene. Featuring a PC-linked reader that reads/writes to 13.56 MHz contactless smart cards in all three HF standards, the OMNIKEY 5321 CR economically supports enduser environments where a variety of contactless cards and tags are used. 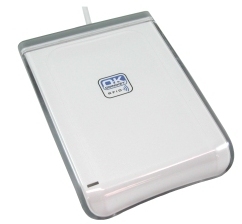 The OMNIKEY® 5321 is a dual interface PC-linked reader that reads/writes to both a 13.56 MHz contactless smart card and virtually any contact smart card. The dual interface feature economically supports end-user environments where both contactless and contact smart card technology may be in use. The reader supports contactless smart cards with up to 848kbps in the fastest ISO 14443 transmission mode. I clienti che hanno acquistato questo prodotto hanno acquistato anche .. I loghi, i nomi dei prodotti, i marchi ed i simboli sono di proprietà delle rispettive società.